(18 November 2016) – ILEIA – Centre for learning on sustainable agriculture, an independent organisation based in the Netherlands that supports agro-ecological approaches and family farming, has published a new report on how to amplify agroecology. In May 2016, the AgroEcology Fund (AEF) and the Alliance for Food Sovereignty in Africa (AFSA) brought together 70 people from 30 organisations for an Agroecology Learning Exchange. 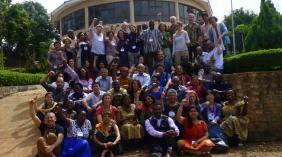 The goal of this Exchange was to share experiences and ideas about amplifying agroecology. Looking at the spread of agroecology as something different from traditional ‘scaling up’, they identified key lessons from their work. ILEIA facilitated the event, and also compiled the rich insights of the meeting in a new report: ‘Agroecology Learning Exchange’.